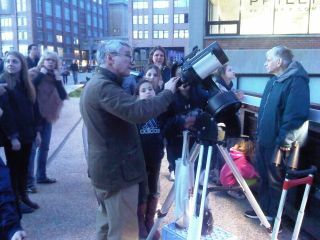 Joe Delfausse, a member of the Amateur Astronomers Association of New York, helps a group of children observe the moon from New York City's High Line park. NEW YORK — Anyone who thinks you can't do backyard astronomy in Manhattan should take a stroll along the city's High Line park on a Tuesday evening. Every Tuesday, weather permitting, members of the Amateur Astronomers Association of New York (AAA) gather at dusk at the High Line — an old, elevated railway that was converted into a mile-long park above the lower west side of Manhattan — to gaze up at the night sky. It's urban skywatching at its best. "People think you can't do astronomy in the city of New York because there's too much light, but the city still offers a lot," said Michael O'Gara, who has been a member of the AAA for 25 years. "If you know where to look, and you concentrate, you can see some amazing things." After breaking for the winter months, the AAA resumed its skywatching sessions on the High Line earlier this week. On April 3, O'Gara and several other members set up telescopes at the elevated park to marvel at the moon, Mars, Venus and Jupiter in the evening sky. While O'Gara and his fellow amateur astronomers take pleasure in picking out these celestial targets in the sky, one of the biggest reasons the AAA holds their weekly observing campaigns is to attract the attention of passers-by so the members can share their enthusiasm and passion for skywatching. O'Gara, who is a past president of the AAA, stood next to his telescope, and as people shuffled past and peered through the eyepiece, he pointed out Jupiter and its moons, plus a band of clouds on the gas giant called the South Equatorial Belt. "You can show people the dot and tell them it's a planet, but when you can show them that you can actually see weather systems on that planet, then you've shown people you can do astronomy in New York City," O'Gara told SPACE.com. The AAA has roughly 400 members, and in addition to holding skywatching events around the city, the group also sponsors lectures and seminars on a range of topics. The organization is a forum for astronomy enthusiasts in the city, but the members also aim to foster appreciation of the night sky among members of the public. "We want to get everyone out on street corners with their telescopes," said Joe Delfausse, the AAA's financial secretary . "It's a lot of fun. Every week is different — there are different things in the sky, and you're dealing with different weather." In some cases, skywatchers don't even need to own a telescope to enjoy the celestial sights. For example, when it's visible, Venus is so bright it can be easily spotted with the naked eye. "Some of the most extraordinary things that I've seen are things you don't need a telescope to see," O'Gara said. "I've seen meteor showers and comets with just my eyes that were absolutely awe-inspiring." The urban surroundings at the High Line play their part as well. The park attracts a lot of foot traffic, and the telescopes draw in curious passers-by to stop for a few moments to stare up at the night sky. "It's a park, so everyone is happy," said AAA member Howard Fink. "The location does help. When you're at the High Line, you're above the city but you're still part of the city."